OK… so I've been very quiet since the holidays. Part of it was the football play-offs (and we won't talk about the result of the Super Bowl ever again! ), and part of it has been sheer laziness. But, with the promise of Spring just around the corner, I've started to come out of my self-imposed hibernation and I'm ready to start piecing together some posts for the Quilting Business community. When I'm searching for inspiration, one of the places I like to visit is www.flickr.com, which is a wonderful photo-sharing community. (SIDENOTE… In order to use the photos in my blog, I always search for the photos that are released under the Creative Commons license. Please don't just use these photos without first making sure the photographers allow it, and under what circumstances). I was searching today and found some wonderful photos from a photographer named Kajsa Wikman (flickr profile name -syko-) who also happens to have a craft business of her own. And many of her crafts are hand-quilted items that go beyond just the traditional quilt to include mini-quilts, mobiles, dolls, laundry bags, and more. 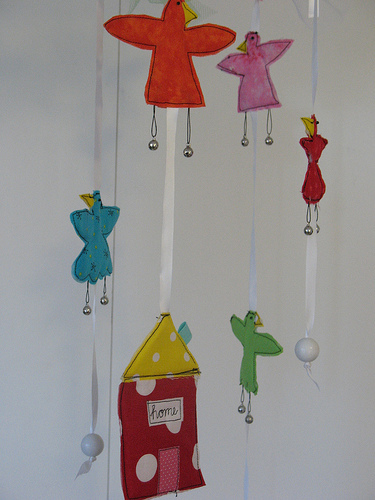 Even more, Kajsa is using www.etsy.com to sell her crafts online. You can see her complete line of products in her etsy store at syko.etsy.com. Please take a moment to visit her store as there are some wonderful items, and some great ideas. What I'm trying to get across here is that there are more ways to run a quilting business than just producing full-size quilts. People love quilted items of all types, and Kajsa's quilted items are a remarkable example of the types of ideas you can come up with if you start to think outside the box. And these smaller items are great for online sales as well as craft shows – people who would have no intention of purchasing a $500 quilt would love to have a $30 or $40 mini-quilt that they can use as a wall hanging. So, as I start ramping up the quilting business posts, I want you to start thinking about entire product lines, including smaller items all the way up to your signature pieces, whether they be full-size quilts or some quilted wearables. I’m glad you’re back. It’s always interesting to read your thoughts on the quilting biz. Thank you for sharing Etsy.com with us. I recently heard about this site from a quilt student of mine and hadn’t explored it until today. I have a good number of items in my inventory that I’ve been wanting to put into a shopping cart on my own web site, but I can see starting with Etsy.com and testing the waters, as they say. I have a lot of placemats, table runners, napkins that are seasonal that I used to sell at an artisan collective. 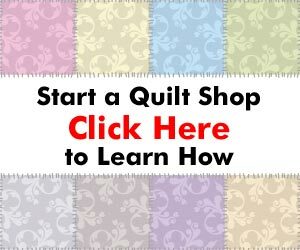 Etsy looks like the perfect place for me to use to reduce my inventory and try adding some small quilts such as Katja makes. Thanks for sharing this information and I look forward to hearing more of your “outside the box” ideas for my quilting business. thanks for all the great info. love looking everything up. keep up the good work. thanks again. Chuck, Glad you’re back…How ’bout those Giants!! 😉 Thanks for the neat website. My sis & I are starting our sewing/quilting business in babysteps as we both still work full time for the next couple of years. I enjoy and learn from your comments and go back to your book from time to time for information & advice. Keep up the great work. PS-there was no quilting at my hours during the playoffs, loved every (well, almost) minute of them. Thankyou for all the work you put into it! Good luck with everything Chuck!